Blue Stone Auto Club was denied permit to hold an auto rally in a closed gravel pit located in the Cerrillos Hills. Subsequently the Club's agent, Robert Kryder (CEO of Kryder Exploration LLC) was served a Notice of Violation when the auto race attempted to proceed. 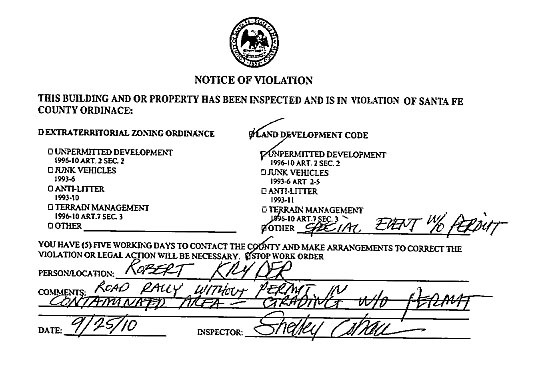 According to records on file at Santa Fe County, Kryder Exploration LLC is the Renter under a "property rental agreement" contract with Brad A. Aitken of Houston, TX , the owner of the closed gravel pit and properties located adjacent to the Cerrillos Hills State Park. The Blue Stone Auto Club's rally application was for Saturday, 9-25-2010. The Santa Fe County Land Use Administrator had issued a detailed 2-page Memo the previous Thursday, outlining the reasons why he "must consider all permanent and temporary business licenses and permits in relation to the public health, welfare and safety." The Memo is presented below in full. After sighting extensive County legal requirements, Administrator Jack Kolkmeyer judged as follows: "The Blue Stone Auto Club application does not satisfy my concerns for many issues pertaining to this particular area. The County has been involved in the development and protection of the Cerrillos Hills Park for many years as a 'low impact public access to the unique natural, historical, archaelogical, cultural and recreational resources of the Hills'. Traditionally, hiking, biking and equestrian activities have been allowed in this area and in the Park in particular. It is my opinion that auto racing and auto events in proximity to these resources is in conflict with the stated County and State goals envisioned for this area." Note that a settlement agreement was reached in 2007 between Santa Fe County, RCA, and Aitken in which the County agreed to purchase most of the Aitken property as Open Space contingent upon conditions including environmental clearance. An Environmental Site Assessment, completed in 2010, is a step toward remediation of contaminates from old mining operations. Additional concerns as listed in the County Memo are elaborated under the headings: 1) the nature of the event is confusing, 2) applicant did not hold a community meeting with Cerrillos but rather attended a meeting held for another purpose, 3) Agency reviews were not complete regarding fire and personal safety issues, & 4) Environmental and Health Concerns related to possible lead tailings present on these properties. The Administrator's concluding statement warns "that in the event that the promoter [Robert W. Kryder of Madrid] decides to hold this event, a Notice of Violation will be issued and the County Sheriff's Office will be notified to close the event." The event was attempted, a Notice was served, and predictably the event was then closed. A few who had traveled from Santa Fe & Albuquerque wondered why the promoters apparently made no or little effort to let them know the event's permit had been denied. "So drove all the way out there to find out it was canceled" wrote one disappointed fan. "I made the trip out there also. As I was pulling into Cerrillos, I was stopped by a guy driving back from the track. He said that the police closed them down before they ever got started. Had to do with possible lead exposure from the old gravel pit, or so they say" wrote another. But many residents of the Village of Cerrillos and friends of the Park were especially relieved by the County's decision--a judgement that expresses care and respect for our public lands from activities privately conceived and clearly in conflict with the "goals envisioned for this area". As the Land Use Administrator for Santa Fe County, I am denying the application for the Blue Stone Heritage Rally proposed to be held in Cerrillos, NM in the vicinity of the Cerrillos Hills Park, on Saturday, September 25, 2010. In my capacity, and pursuant to the Land Development Code and Ordinance No. 1993-2 ("the Ordinance"), I must consider all permanent and temporary business licenses and permits in relation to the public health, welfare and safety. A temporary business license is required for the activity described in the application (a "licensed activity" for purposes of Ordinance No. 1992-3 includes "exhibitions," "festivals" and "motor vehicle races"). See also Section 9(B) of the Ordinance. A person seeking a temporary business license must apply for and receive a business license pursuant to Section 3(B) of the Ordinance. Before a license may be issued, the County is empowered to "... make inspections and investigations of the person applying for the license and the properties on which the licensed activities will take place " Ordinance, Section 3(B)(2). The purpose of the inspection and investigation is to " prevent nuisance conditions and protect (the) health, safety and welfare of County residents and patrons to the proposed licensed business." A temporary license may be refused if the investigation "... reports conditions which are unfavorable to such Issuance." In addition, the Land Use Administrator is empowered to create "further requirements" in furtherance of the public health, safety and welfare, may create restrictions or limitations on the activity, and may impose requirements or conditions on the issuance of a license. Engaging in licensed activity in violation of the Ordinance is a crime. The Blue Stone Auto Club application does not satisfy my concerns for many issues pertaining to this particular area. The County has been involved in the development and protection of the Cerrillos Hills Park for many years as a "low impact public access to the unique natural, historic, archaelogical, cultural and recreational resources of the Hills". Traditionally, hiking, biking and equestrian activities have been allowed in this area and in the Park in particular. It is my opinion that auto racing and auto events in proximity to these resources is in conflict with the stated County and State goals envisioned for this area. 1. The nature of the event is confusing. The application suggests it is a charity event for the Cerrillos Hills Park, the Socorro Bureau of Mines and the Aitken family, who are the owners of the property. The letter accompanying the application states that the event will include live music, a DJ, an auction, a raffle, horseshoe toss, frisbee and face painting. On an adjoining piece of property the club may have cars out and driving. However, a flyer for this event that has been out for a number of weeks lists product and food vendors and "extreme rally racing". The promoter suggests that attendance will be between 30-50 people. This seems like a rather large and intense amount of activity for 30-50 people. While we technically require only two weeks to review a Special Use Permit, I believe that an event such as this needs from 30-60 days to plan with us to make sure that all problems are addressed and all parties are appropriately contacted. Such was the case, for example, for the Santa Fe Muzik Fest held at The Downs several summers ago. 2. I required that the applicant hold a community meeting with Cerrillos residents to discuss this event in detail. They did not do this but rather attended a meeting being held for another purpose, the Agavue wireless project. Apparently, they showed up at the end of that meeting to talk with a couple of people in attendance. This is not what they needed to do. They needed to [hold] a meeting for their project and to explain it to the community. Consequently, I do not have adequate feedback from the community. 3. Agency reviews are not complete two days before the event. I do not approve permits or licenses without concurrence of our Fire/EMS staff. As of today, I have not received this concurrence and, given the nature of the proposed event, I have concern for fire and personal safety issues that might arise. 4. Environmental and Health Concerns. Our Community Services Department contacted me earlier this week to inform me that there may be lead tailings present on these properties and such tailings might be disturbed by the uses being proposed for this event. Staff forwarded me documents prepared by Environmental and Safety Solutions, Inc. for the Environmental Protection Agency indicating that the general vicinity has been heavily impacted by former mining operations. Of particular concern is the prevalence of lead in the vicinity. I am not able to determine the exact locations of these threats and their potential harm without further study. Again, time does not allow for the necessary investigation and study on our part. Consequently, for the reasons stated above, I am denying this application and advising the applicant that if they want to pursue those kinds of events in the future, they need to be engaged in more comprehensive planning with all parties involved. We will be happy to work with them in the future. In the event that the promoter decides to hold this event, a Notice of Violation will be issued and the County Sheriff's Office will be notified to close the event.